Spring has SPRUNG! We’ve been sleeping with the windows open the past few nights and it’s been heavenly. A lot has been happening in my life and world but first I will say that I am MUCH more into my outfits and makeup than I’ve been in a long time and it feels so good. I was home in Illinois last week and got to see my friend Alex and shoot around a little. 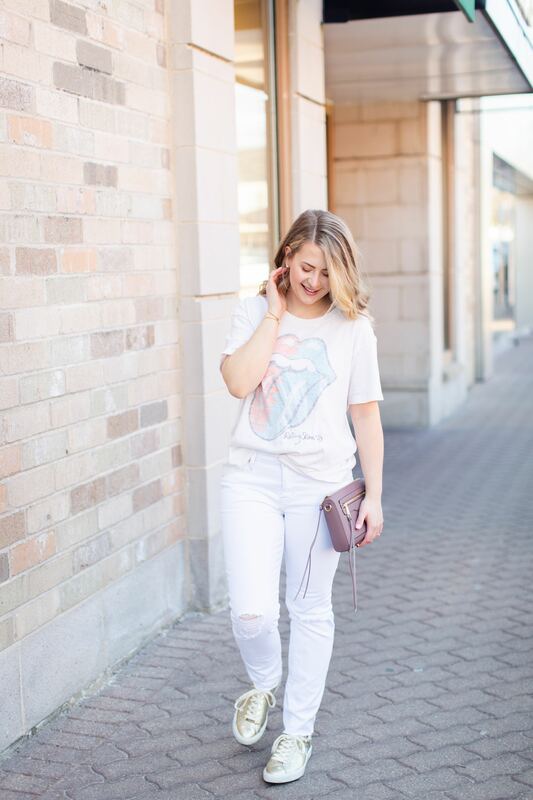 I got some new white jeans and have been FEELIN’ myself wearing them, so I wanted to share two easy looks for white denim. I’ve always loved the look but honestly, they can be intimidating! It’s hard to know what to pair with such a bright color pant. 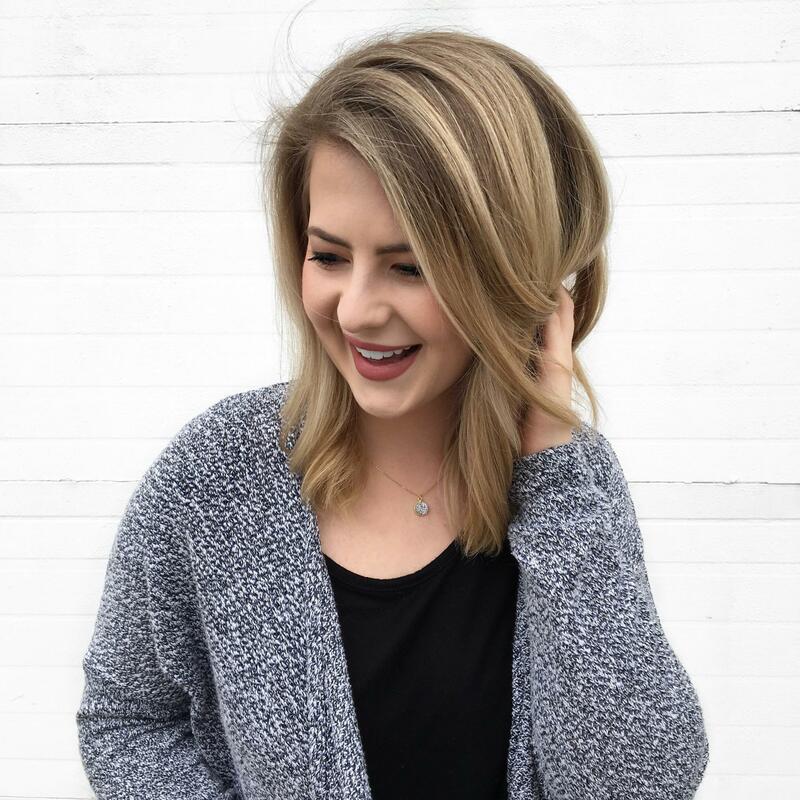 If we’re being totally honest, this look is 100% inspired by Mallory Ervin. I’m obsessed with her style and was nervous about pulling off the all-white look but love how it came together. 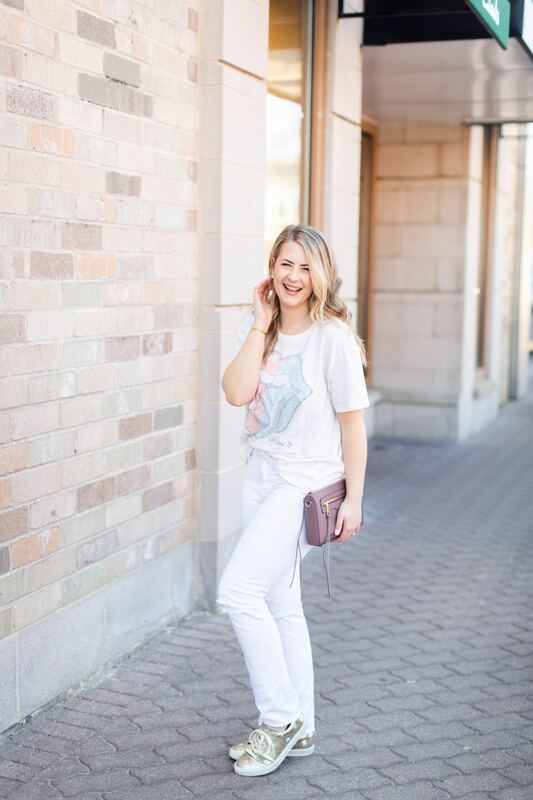 Coming from someone who typically wears black jeans and a grey tee, this white look feels so bright and clean for spring! 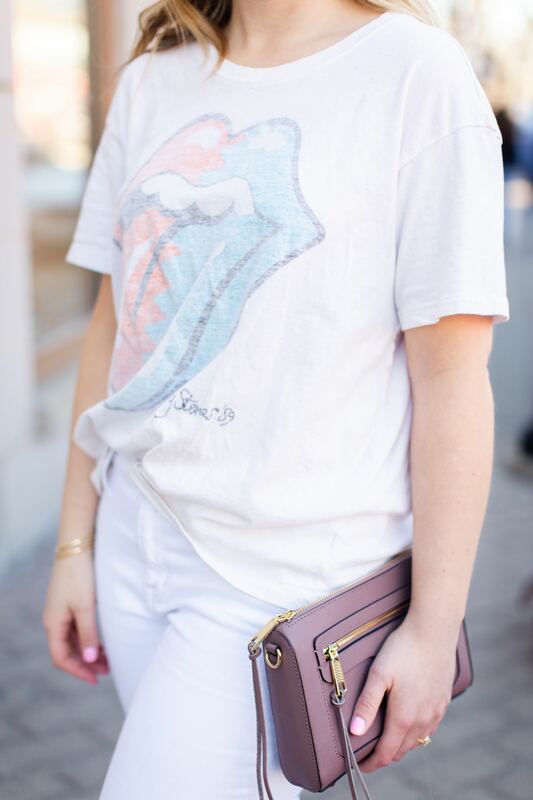 My most worn look with white jeans will definitely be a little blouse and sandals or wedges. 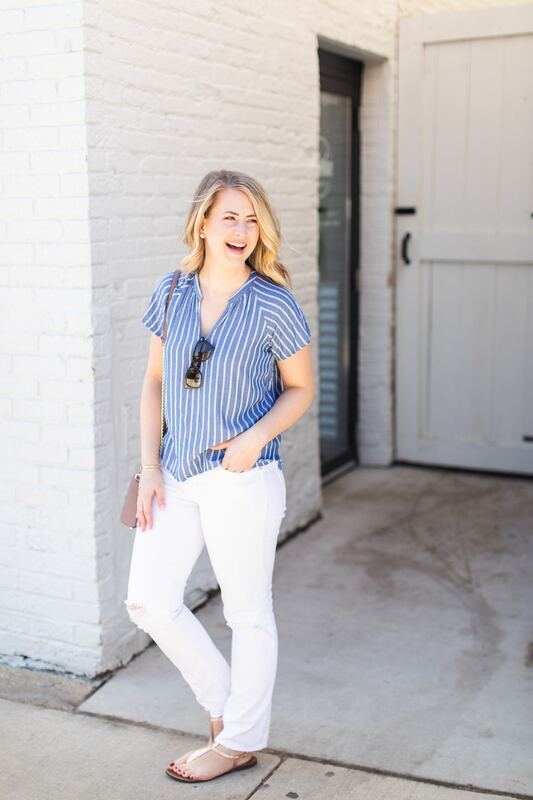 Stripes are a STAPLE in my closet and almost everyone has a cute striped top in their closet. Throw on a jean jacket for a really effortless, classic look. Two pieces that you see a lot are my folding Ray-Ban Wayfarer Sunglasses. I’ve had them for 7 years now and they are still my favorite pair of sunglasses. Plus since they fold, they’re ideal for summer because you can pop them in smaller pockets! I also have two pairs of the Sam Edelman Gigi Sandals. They’re really high quality and will last you more than just one season. I just replaced my rose gold pair once my previous pair finally bit the dust. Highly recommend. 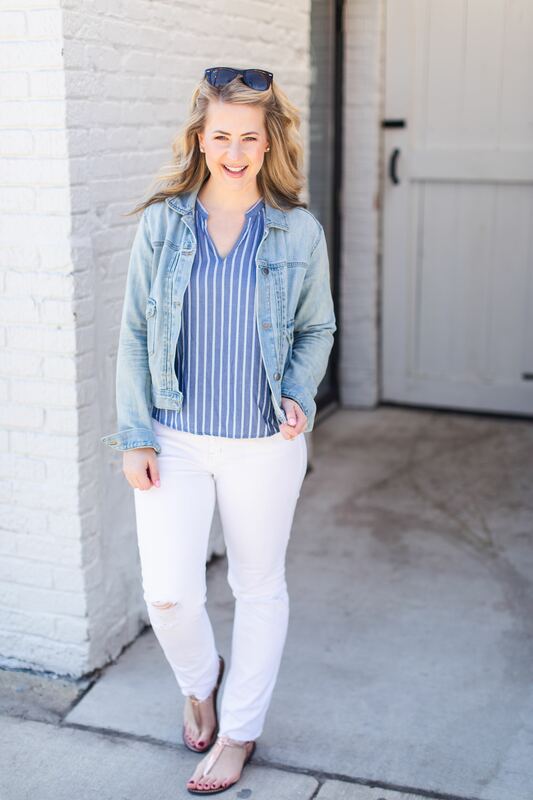 Since you may not want to invest in a pair of white denim like you would a classic wash, I wanted to round up some of the best options out there. Unfortunately the pair I’m waring is sold out, but they are from Madewell! I have normally been a Gap loyalist for my jeans but have been trying to branch out and try other brands. White denim. What do we think? Are you into it?